This is the fourth course in the 11-part series of Building a Community-Based Palliative Care Program. You can take this single course or the entire series. For many palliative care providers, partnerships have made the difference between success and failure. Partnership with other providers or community organizations can help you identify and access patients, meet fiscal goals, or improve patient outcomes. Identifying Potential Community or Organizational Partners to Strengthen Your Palliative Care Program explores specific ways partnerships can enhance your palliative care program. You’ll come away with strategies for measuring the return on your partnership investment as well. Click here to join the interest list and get the brochure! Learn More About this Course! This course was written by Kathleen Taylor, MA, LMHC, President of KT Coaching & Consulting, where she provides healthcare coaching and consulting services that enhance communication and connection. Taylor’s 22+ years of expertise in hospice and palliative care, advance care planning, community engagement, and program development, will provide you with key strategies for evaluating potential partners and identifies methods for strengthening current partnerships. Click HERE to learn more about all the courses in this series. Here’s a tool that can you help you with the challenges that arise when your patients develop serious, chronic, or progressive illness. It includes case studies, key practice points, and resources to have those difficult conversations. 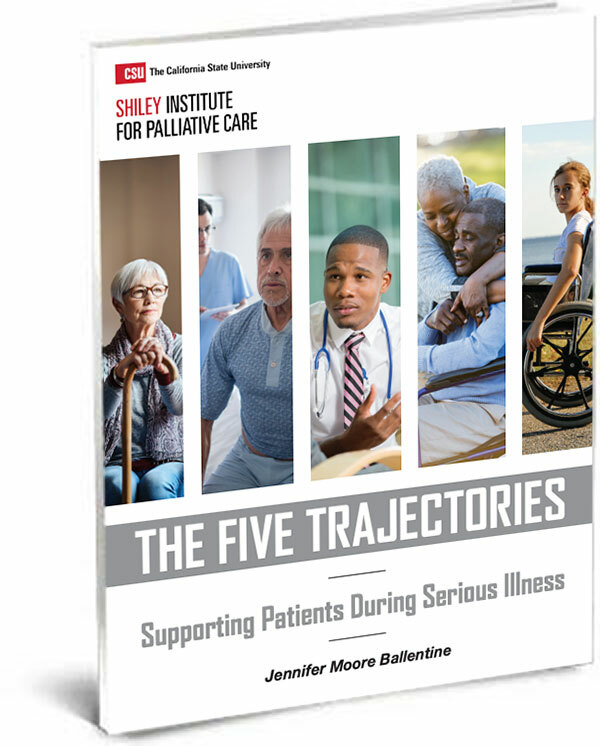 Download your free copy of: The Five Trajectories – Supporting Patients During Serious Illness by Jennifer Moore Ballentine. Sign up by clicking HERE or the image of the eBook. The Doctors Company designates this activity for a maximum of 1 AMA PRA Category 1 Credit™. Physicians should claim only the credit commensurate with the extent of their participation in the activity. This activity has been planned and implemented in accordance with the accreditation requirements and policies of the Accreditation Council for Continuing Medical Education (ACCME) through the joint providership of The Doctors Company and California State University Institute for Palliative Care. The Doctors Company is accredited by the ACCME to provide continuing medical education for physicians. Call to buy the entire series: 760-750-7288. One of the benefits of palliative care is that it breaks down silos between healthcare providers. By engaging partners your community-based palliative care program can experience increased referrals, greater visibility, and new expertise to strengthen your program. Explore ways your organization can develop partnerships that help you reach your goals sooner. Examples of community-based palliative care partnerships are provided. Recognize the importance of measuring the impact of partnerships, as well the specific benefits each partner receives. Kathleen Taylor, MA, LMHC is the President of KT Coaching & Consulting, where she provides healthcare coaching and consulting services that enhance communication and connection, and improve the patient and clinician experience. Kathleen has over 22 years of experience in the healthcare and nonprofit sectors, with specific expertise in hospice and palliative care, advance care planning, community engagement, and program development. For over a decade, she served as the director of community engagement at the country’s largest nonprofit hospice organization. Previously, she managed a national Robert Wood Johnson Foundation grant program establishing grassroots coalitions to improve end-of-life care, and worked for over 7 years as a hospice counselor serving patients and families coping with life-limiting illness, caregiving and grief. In 2012, Kathleen delivered a TEDx talk about living an authentic life, which has since been shared around the world and used in social work curricula and other training programs. Kathleen is a Florida Licensed Mental Health Counselor and Qualified Clinical Supervisor. She earned a Bachelor’s degree in Psychology at Stetson University, a Master’s degree in Mental Health and Rehabilitation Counseling at the University of South Florida, and a Graduate Certificate in Nonprofit Management & Innovation at the University of Tampa’s John Sykes College of Business. 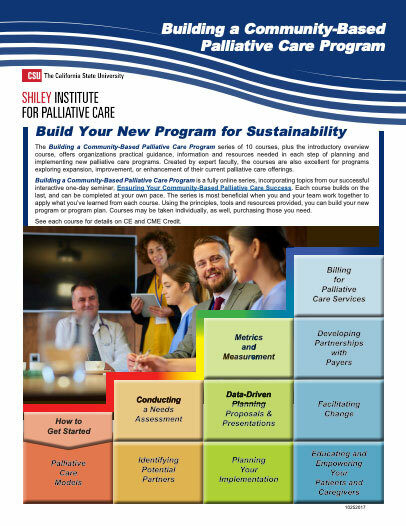 This is just one of 11 courses in the Building a Community-Based Palliative Care Program series designed to help you build a sustainable palliative care program. Navigate below to see related courses in the series.